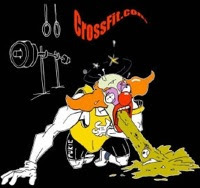 2011 Reebok CrossFit Games Preview Show, Thursday July 28th, 6:00 p.m. PST. Ludwig van Beethoven, String Quartet No. 13 in B major, Op. 130. Stephen Crane - The Duel That Was Not Fought. "Google: The Beginning" by Douglas Edwards, The Walls Street Journal. Annie Thorisdottir at the Games athlete swim test. The Games Update: Two Days Out. Post each 800meters to comments. "Traveling in areas with no local boxes can be tough, but with minimal equipment and a little creativity you can have a lot of fun! Thanks for all you do HQ!" - Cody Gauer, San Sebastian. "Military Report: Secretly 'Recruit or Hire Bloggers" by Noah Shachtman, Wired. Becky working hard with a WOD at BU CrossFit. Ben Scism, Shawna Meharg, and Ken Meharg, Springdale, Arkansas. "Wi-Fi-Hacking Neighbor From Hell Sentenced to 18 Years" by David Kravets, Wired. Jason Khalipa 11:18, Carey Kepler 11:01. Post time to comments. Go Kayla, you make it look so easy! "Do not be desirous of having things done quickly. Do not look at small advantages. Desire to have things done quickly prevents their being done thoroughly. Looking at small advantages prevents great affairs from being accomplished." Mike doing some push ups nice workout at BU Crossfit. Pat Barber 190lbs, Lucas Zepeda 160lbs, Kevin Montoya 100lbs, Laurie Galassi 90lbs, Danielle Edmundson 75lbs. Jackson Hodgson, 100lb atlas stone. CrossFit Level 1 Certificate Courses: CrossFit Ann Arbor, CrossFit Reston, CrossFit SS, CrossFit Brisbane, CrossFit Central London. "I was up in Togiak, Alaska all the way across the Bering Sea involved in the herring fishery this spring. No CrossFit facilities for thousands of miles, but a piece of driftwood made for an impromptu workout. Had to keep the .44 magnum on the pack close, due to hungry bears around." "Full Civic Literacy Exam", Intercollegiate Studies Institute. Bill Grundler 14:04, Kevin Montoya 16:46, Justin Judkins 21:21. Chad O'connor, Fossil Springs, Arizona. Chris Spealler 200-180lbs. Post the highest and lowest loads to comments. CrossFit Level 1 Certificate Courses: CrossFit Hafnafjordur, CrossFit Santa Clara, CrossFit Strong, CrossFit Memphis, CrossFit Colosseum. "To Be Or To Do?" by Col John R. Boyd, USAF. "US Army Cuts Off Five Fingers, Bangs Head" by Thomas Rid, Kings of War. 3 Rope pulls, don't let the rope slide back down. For the handstand push-ups, the ears should dip below hand level. For the one-legged squats, alternate legs. Always wanted to hike this mountain, but never felt I was in good enough shape to even attempt it. CrossFit has opened the door for me to attempt things I never thought I could do. Thank you for sharing CrossFit with us. "The large print giveth, but the small print taketh away." Henry Quiles, Garreston, South Dakota.